Join the Albacore Park Museum at the Portsmouth Public Library 2019 Lecture Series for an afternoon of discussion and merriment on Saturday, April 27 at 2 P.M. Jack Hunter and Austin "Butch" Jordan will tell stories from the recollections of Albacore crewmen. Following the end of WWII, experts agreed that in order for submarines to improve their survivability in wartime, they would have to improve their submerged velocity and evasive capability. 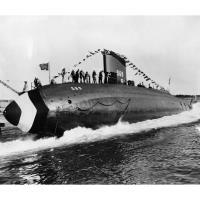 That insight led to the development of the groundbreaking USS Albacore. Its teardrop design was a breathtaking feat of engineering that allowed far greater speed and maneuverability.